Distinctively bright chartreuse foliage sets this dwarf, yet fast growing, shrub apart from other landscape standards. Great as an accent hedge or specimen, Ligustrum ‘Sunshine’ can be used in many different styles of landscapes. Along with it’s use in garden beds, ‘Sunshine’ does well in low maintenance patio containers. Plant this dwarf ligustrum with contrasting foliage colors of purple and red to create a dramatic display. Looking for a low-growing shrub to create small borders or knot gardens? 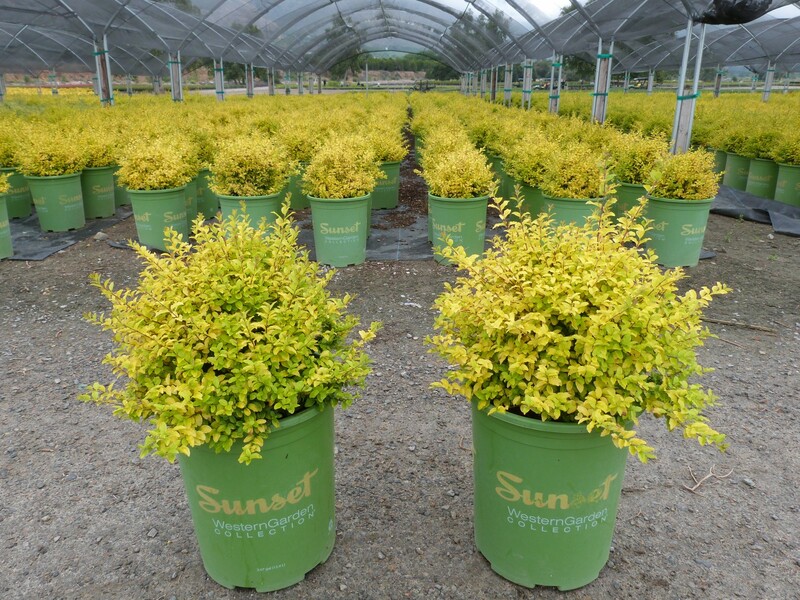 Ligustrum ‘Sunshine’ is the perfect plant. If you’re worried about invasive plants, ‘Sunshine’ is a great choice, as it is sterile so will not spread in the landscape. Although, it will not produce berries for the birds. Tough as nails, this shrub needs little care from you once established. It thrives in well draining soil, but can still tolerate poor or heavier clay soils. Plants do best in full sun, especially if you need to maintain the bright foliage color. If planted in deep shade, it will lose it’s vibrant pigment. Regular moisture is required for establishment and plants can benefit from deep waterings in the heat of the summer. Fertilize seasonally for best results. ‘Sunshine’ is basically pest and disease free.